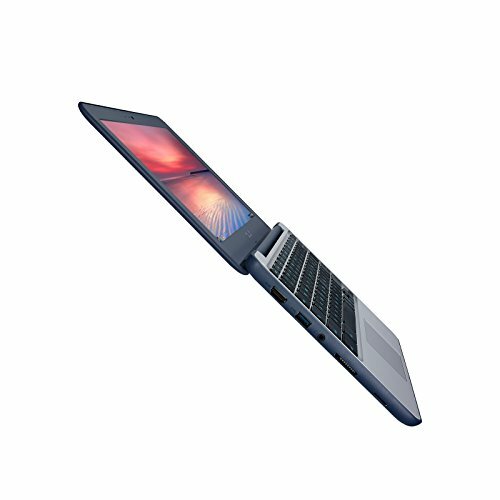 Although it’s a very small laptop, the Asus Chromebook C202 feels like it can take a punch. Built to stand up to the kind of punishment that can only be doled out by school children, the C202’s dotted plastic lid and bottom are surrounded by a rubberized protective ring that serves as armor against drops. 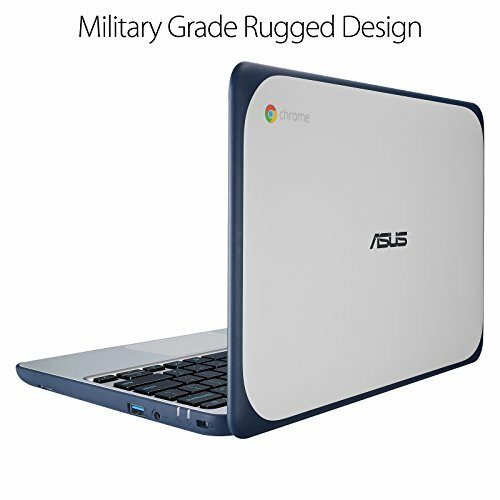 The dark-blue rubber and gray plastic make the C202 look like the official Chromebook of the New York Yankees, but the only logos are Asus’ and the Chrome moniker on the lid. When you open the lid, you’ll see a plastic silver deck with a black, Chiclet-style keyboard featuring blue lettering. 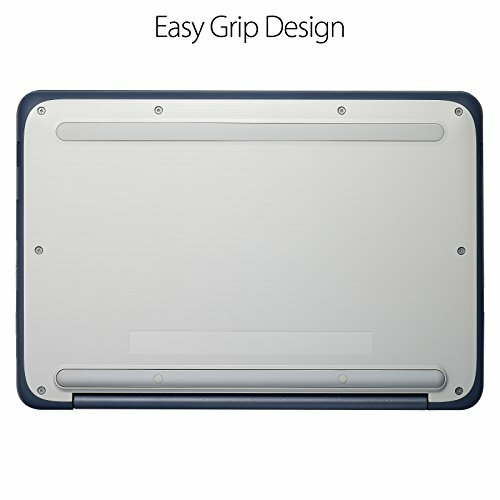 The 11.6-inch, 1366 x 768 display is surrounded by a chunky, navy-blue bezel. Asus claims that when the C202 lands flat, it can survive falls from 3.9 feet, and when it lands on its side, it can survive drops from 2.6 feet. Additionally, the spill-resistant keyboard should handle 2.23 ounces of liquid. I took the Chromebook up to our office roof for some drop testing, and the Asus earned some battle scars but kept on kicking. When I dropped it on its side from 2.6 feet, the C202 came away with just slight scuffs on its rubberized rings. 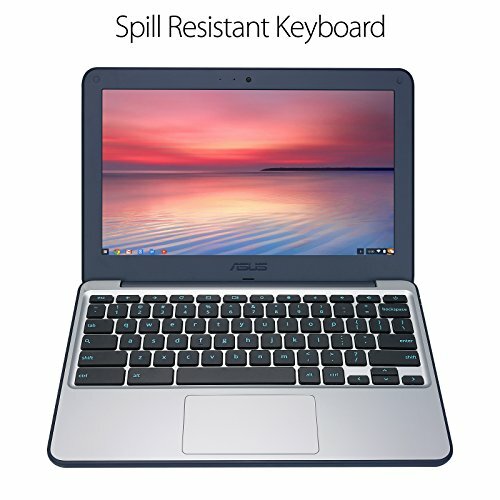 This is one of the best keyboards I’ve ever used on a Chromebook. The keys have 2.1 millimeters of travel and require 60 grams of force to press, resulting in an extremely comfortable typing experience. The 11.6-inch, 1366 x 768 screen on the C202 isn’t sharp, but it’s as crisp as you can expect from a Chromebook at this resolution. Just don’t expect a wide range of colors. I viewed the 1080p Ghostbusters trailer and found that the red on the Ghostmobile was tinted slightly pink, while Slimer’s green goo was paler than it should have been. There are only a few ports along the sides of the C202, but they’re all the essentials that students in classrooms will need. The majority of the ports are on the left side: HDMI, USB 3.0, a headphone/microphone combo jack and an SD card slot. The right side houses another USB 3.0 port, the power jack and a security lock slot. A selfie I took with the 720p webcam had a lot of visual noise. The colors were mostly accurate (with the exception of my face, which looked a little red), but the skylight behind me was completely blown out. 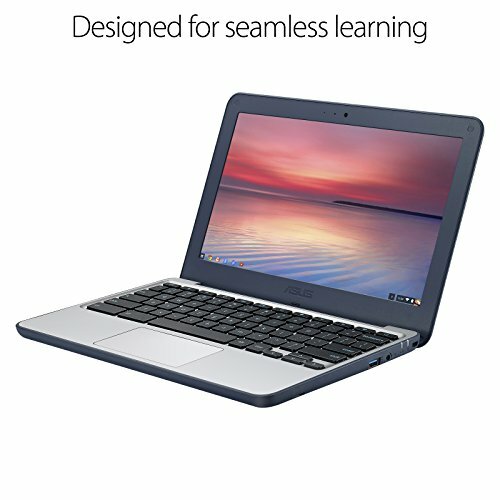 I didn’t expect loud, booming sound to come out of an 11-inch Chromebook, but the C202 punched above its weight class. I listened to Twenty One Pilots’ “Stressed Out” and found that the mids and lows were clear and the bass was decent. When I pumped up the volume to its max, the sound became slightly muddled. With a 1.6-GHz Intel Celeron N3060 processor and 4GB of RAM, the C202 isn’t a performance powerhouse, but it’s fine for writing book reports or even manipulating spreadsheets. Just don’t do too much multitasking. The browser started to lag when I scrolled through websites with only six tabs open. Students should be able to use the Asus Chromebook C202 throughout the school day without being tethered to an outlet. The laptop lasted 8 hours and 23 minutes on the Laptop Mag Battery Test, which consists of browsing the web continuously over Wi-Fi. That’s longer than the CTL Chromebook J4 Plus (6:39), the HP Chromebook 11 (7:10) and the ultraportable average of 8:12. But it was still outclassed by the Lenovo 100S Chromebook’s whopping 11:19. What sets the Asus C202S apart from other low-cost models is the better build and better keyboard, all of which improve the user experience. This is one of the very few bargains I’d heartily recommend.